Yakko’s school has three different 2nd grade classrooms. Last week, the classrooms got together and hosted a Market Day. 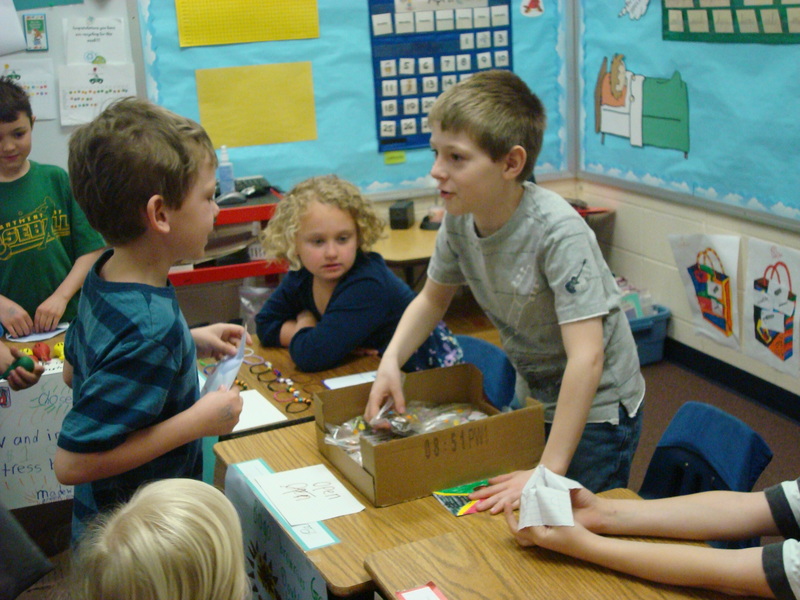 Throughout the week, students were earning play money that they could use during the Market Day. On Market Day, students were supposed to either bring products that they helped make or provide a service for other students. They set up their desks around the room as their storefronts and made signs advertising their product/service. Once the activity started, students would “close down” their shop if they wanted to go shopping and open the shop when they were ready to sell to their classmates. As you would expect, food was quite the popular choice for their businesses. There were a lot of cookie stores and muffin stores. Other popular stores were friendship bracelets, balloon stress balls (filled with sand) and slime in plastic easter eggs. Some of the services included nail salons and fortune-telling. Yakko opted for food, specifically brownies. Those of you that follow me on Twitter know that Mrs. O’Doyle and I held a bake-off a couple of weeks ago so Yakko could decide what recipe he would use. Mrs. O’Doyle chose to use a brownie mix from a box and add mini M&M’s. Wakko thought that one should have been the winner but in the end, it was the Two-for-One Brownie with brownie on the bottom and chocolate chip cookie on top that was the winning recipe. Yakko thought he would have a much better chance of selling by promoting it as two treats in one. Scroll down for the recipe. It turns out he was right, he was one of the first students to sell out of their products. It was interesting talking to him after the event was completed. He said we would have left to go shopping, but every time he was going to go another student or teacher would come by to buy a brownie. He didn’t want to leave if people were still coming to his store to make a purchase. Even in 2nd grade he quickly figured out that although it may be fun to go shopping, if you want to sell something, you need to put in the time and work. Now then, for the recipe. I will say that it’s a pretty simple recipe that I’m proud to say Yakko was able to make himself (of course with supervision – like I’m going to let a 7 year-old use the oven by himself). We hope you enjoy these delicious treats. In a medium-sized bowl, melt 12 tablespoons of butter slowly in the microwave. Whisk together with 3/4 cup unsweetened cocoa powder. Add 1 1/2 cups sugar and 1/8 teaspoon salt whisking until smooth. Add 2 eggs until blended. Add 1 1/2 teaspoons pure vanilla extract. Mix 3/4 cup all-purpose flour until just blended. Pour into 9″ x 13″ baking pan and gently spread evenly over the bottom. In a medium-sized bowl, melt 12 tablespoons of butter and whisk together with 1 cup firmly packed brown sugar until smooth. Combine 1 1/2 cups all-purpose flour, 1/2 teaspoon baking soda and 1/8 teaspoon salt and mix until smooth. Add 1 egg and 1 teaspoon pure vanilla extract mixing until smooth. Fold in 1 cup miniature semi-sweet chocolate chips. Carefully add cookie mixture over the brownie layer and smooth to create an even top layer. Bake at 325 degrees for 30-40 minutes or until a toothpick inserted in the center comes out clean. Cool to room temperature. Cut into bars and serve.